When Microsoft released an update to its IntelliType keyboard software to coincide with the launch of Windows Vista, it conspicuously dropped support for one if its keyboard models: the Microsoft Natural Keyboard Pro (pictured). When you select the keyboard model on Microsoft's keyboard software download page, the latest operating system supported is Windows XP. At first glance, Vista and Windows 7 users would appear to be out of luck. 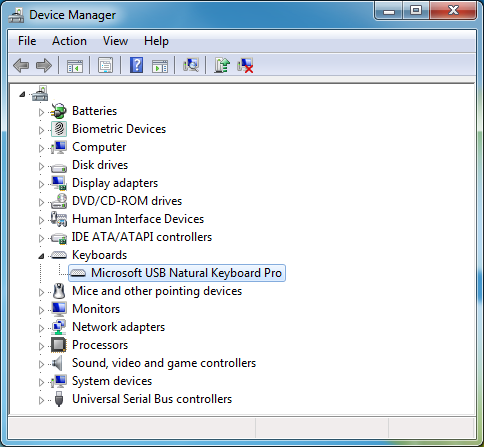 While the standard keys will work without any special software in any version of Windows, the IntelliType software is required to make full use of the extra "media keys" at the top of the Natural Keyboard Pro. These extra keys control music and video playback, web browser navigation, and some other convenient functions. Some clever users quickly realized they could get partial functionality by selecting a similar keyboard model instead ("Internet Keyboard", "Natural Ergonomic Keyboard 4000" or "Natural MultiMedia Keyboard"), but that method is an incomplete solution: the media keys will then work with their default behavior but can't be reprogrammed. Whereas in Windows XP you could set the Media key to open iTunes (for example), in Vista or Windows 7 the button would only launch Windows Media Player. I was OK with this limitation as a Vista user, but with the awful changes in Windows 7's Windows Media Player 12, I was inspired to find a way to reprogram the Media button to launch a more sensible music program. Good news for Natural Keyboard Pro owners: the instructions below describe an easy way to restore full functionality for the keyboard under Windows Vista and Windows 7, including programmable media keys. As with certain other Microsoft hardware, this seems to be a case of Microsoft phasing out support for a perfectly functional product for questionable reasons. Follow the steps below to set up the Microsoft IntelliType Pro software with your Microsoft USB Natural Keyboard Pro on Windows Vista or Windows 7 (32-bit or 64-bit). If Microsoft has released a newer version of IntelliType since this article was written, your results may vary. The current version as of this writing (according to the installer filename) is 7.00.260.0. It's possible that future versions may include changes that make these instructions obsolete. If you decide to install a newer version of IntelliType and run into trouble, uninstall it and use the version linked above instead. Run the installer you downloaded. When asked to select your keyboard model, choose "Natural MultiMedia Keyboard." You will also be asked if you would like the software to automatically check for new versions. I suggest you disable automatic updates: a new version of the software could undo the changes you will be making here. You will be modifying some of the files that come with the IntelliType software. First, locate each of the files listed below and make a duplicate copy in another location, such as on your Desktop. 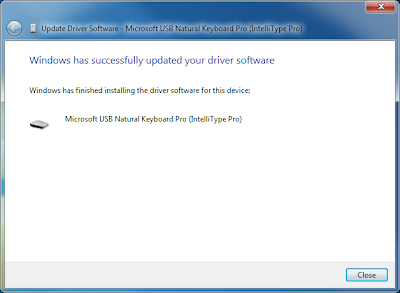 DeviceDesc="Microsoft Keyboard IntelliType Pro Driver"
HID\VID_045E&PID_001D&MI_00.DeviceDesc = "Microsoft USB Natural Keyboard Pro (IntelliType Pro)"
Save the file and proceed with Step 5. You will copy and paste a long section of text after </Device>. To keep the instructions readable, I am including the text in an appendix at the bottom of this article. Copy the text from the appendix and paste it into the file after the </Device> line. Now copy the 2 files you modified in the previous steps back into the IntelliType folder, overwriting the original copies. You may wish to make another backup copy of the originals before replacing them. You may receive a message saying "You'll need to provide administrator privileges to copy to this folder." If so, be sure to confirm by clicking "Continue". 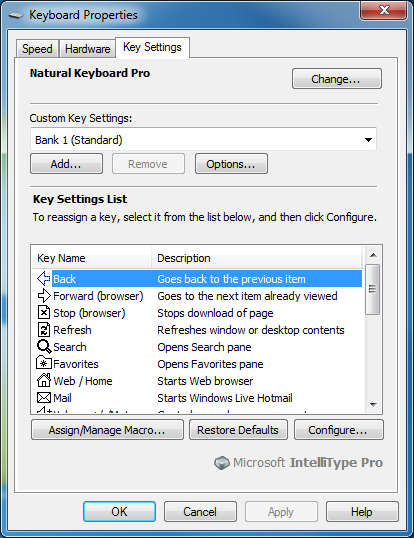 Right-click the keyboard icon and choose "Keyboard settings"
In the IntelliType settings, click the "Change..." button. The Natural Keyboard Pro should now be listed as an option. (Note that you will not see a photo of the keyboard, but that's OK.) Select the keyboard model and click "OK". The list of media keys should now correspond to the buttons on your Natural Keyboard Pro. Reprogram a media key to test the software. For example, change the Calculator button to launch another program and make sure it works as expected. I found the hardware details for the Natural Keyboard Pro by examining the .INF file from IntelliType Pro 5.5, the last version of IntelliType (released for Windows XP) which supported that model. I created the media key definition (the text added to ITypeDevices.xml) using the other keyboard models in that file as an example, and by cross-referencing with mscmdkey.xml (another configuration file found in the IntelliType folder). The Device ID I chose (1001) has no special significance, except that it was not already used elsewhere in the file. The same is true of the OemAbbreviation "NKP". It's difficult not to be suspicious of Microsoft's motives here. 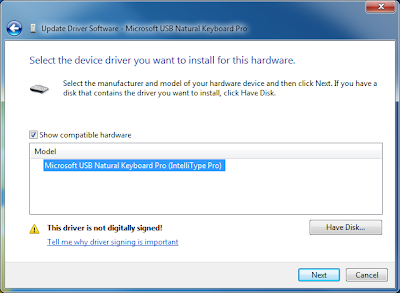 From all appearances, they could have simply left the Natural Keyboard Pro lines in the driver and it would have continued to work perfectly with Windows Vista and Windows 7. Instead, the company went to the effort of specifically deleting that model from the driver, possibly hoping owners would surrender in frustration and buy Microsoft's top-of-the-line model instead. Perhaps Microsoft should start thinking of reliable products that work for many years as a selling point and a mark of pride, rather than a burden on their future hardware sales. If you have a Microsoft Fingerprint Reader, Microsoft will tell you that it won't work with Windows 7. 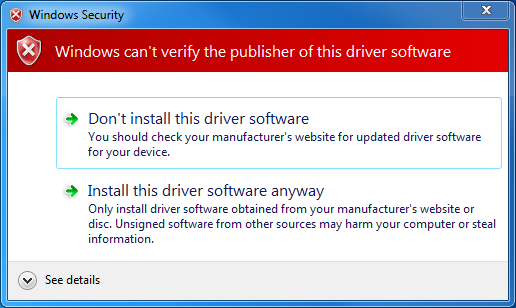 If you try to install the driver software anyway, Windows blocks it for "compatibility reasons." 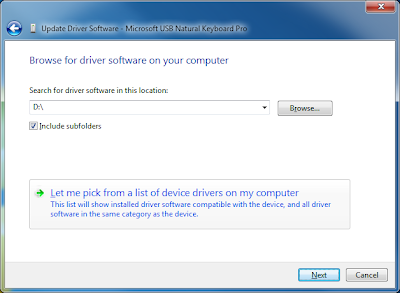 However, using the instructions in this post, you can install the software and use the fingerprint reader successfully in Windows 7 (32-bit edition only). No one expects ancient devices to be supported by a manufacturer for eternity, but it's frustrating when Microsoft discontinues support for using its own devices with its own software. A cynic might speculate that Microsoft is trying to cut corners on support costs and force users to buy new hardware with a policy of planned obsolescense. Based on how well the fingerprint reader works in Windows 7 despite Microsoft's insistence, there's certainly evidence for that perspective. These instructions assume a "clean install" of Windows 7. If you upgraded a Windows Vista installation that already contained the DigitalPersona software, users have reported that the fingerprint reader should continue working without any extra steps. Other similar fingerprint readers, like those built in to HP laptops, use different driver software and will not work with these instructions. This post refers only to Microsoft-branded devices. 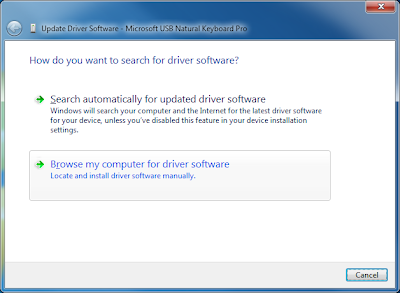 Follow the steps below to install the Fingerprint Reader driver software on Windows 7 (32-bit). Follow any of the download links below. I am including multiple links in case Microsoft removes the installer in the future (since the product itself has been discontinued). Click "Cancel". We're going to have to bypass the PCA to get this installer to run. We're going to disguise the identity of the installer so the PCA will allow it to run. How does Windows know in advance which programs might be incompatible? It contains a hard-coded list of ID numbers for programs that Microsoft or another manufacturer has flagged as potentially dangerous (either to your computer or to the company's profit margin). We can't modify that hard-coded list, but we can change the ID number that the installer reports to Windows. When you ran the DigitalPersona installer -- even though it did not fully launch -- it extracted another install file to your computer. The other install file is called WIS73ECBBAB86D84A32854CDCAF90E63AFE_2_0_1.MSI and is found in the C:\Program Files\Common Files\Wise Installation Wizard folder. Locate the MSI file on your computer and copy it to your desktop (or another folder of your choice). You will be modifying this duplicate copy. 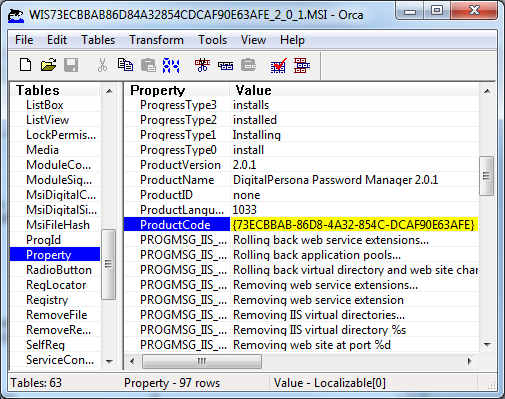 After downloading, double-click orca.msi to install Orca. If you prefer, you can also use an equivalent third-party tool like InstEd. However, the instructions that follow relate to Orca. Save the file in Orca and close Orca. If you don't close Orca, you will not be able to proceed. That's all that is required; now that the installer has a slightly different product code, it will no longer match Windows' blacklist of dangerous programs. Now find the DigitalPersona MSI installer file you just modified on your computer and double-click it to open it. You should no longer receive a PCA error box. If you did, make sure you have closed Orca, make sure you are trying to run the correct file and double-check that you've completed these steps correctly. Right-click DPAgnt.exe and open "Properties"
Under "Compatibility mode", check "Run this program in compatibility mode for" and choose "Windows Vista"
There are 3 similar compatibility options listed: "Windows Vista", "Windows Vista (Service Pack 1)" and "Windows Vista (Service Pack 2)". I used the regular "Windows Vista" option. Under "Privilege Level", check "Run this program as an administrator"
Now return to the installer and click the Finish button. The installer will ask to restart your computer; go ahead and allow it to restart Windows. Once Windows restarts, browse back to the C:\Program Files\DigitalPersona\Bin folder in Windows Explorer. Right-click DPAgnt.exe and open "Properties" to the "Compatibility" tab once more. Click "Change settings for all users" and under "Privilege Level", uncheck "Run this program as an administrator". Click OK to close the "Compatibility for all users" box and OK again to close the Properties box. Make the same change to DPConsol.exe in the same folder. Now restart Windows again, or just log out and log back in if you prefer. When Windows starts back up, the fingerprint reader initial setup window should appear automatically. Follow the instructions to set up your Windows logon password, fingerprints, and so on. You should now be able to use the fingerprint reader normally to log in to Windows and automatically enter other passwords in Windows 7. The necessary file permissions were first discovered and documented by Saulo Castelo Sampaio and Dav at SevenForums.com. Microsoft first fell short in its support of the fingerprint reader when it promised drivers for Windows Vista 64-bit, then failed to deliver them. The company eventually acknowledged its broken promise by quietly offering a refund to device owners who were unable to use the fingerprint reader with Vista 64-bit. If you were affected by Microsoft's failure to fully support its fingerprint readers, you should request this refund. Follow the instructions at FatWallet to call Microsoft and claim your refund check. Mention that you were unable to use the device with Windows Vista 64-bit. Microsoft will ask for the PID number from the bottom of your fingerprint reader, but will not verify your copy of Windows Vista. Hopefully the expense of paying refund checks to disappointed users will motivate Microsoft and other vendors to fully honor their product support obligations. Digital tips and tricks, in no particular order.